I am available to teach a group meditation retreat usually over a weekend period. I teach students, one to one, the 9 universal stages of meditation. You can follow this course at your own pace. To see the nine stages click above and go to the meditation section of my yoga class. All one to one coaching is £28 per hour so the complete course with 9 stages is 9x£28. Alternatively we can arrange one or two sessions at the hourly rate and create together a method that suits your psychology, need and value system. Many people say they can't meditate. Learning to meditate usually requires help. Some technique, some practise, and some help from like minded people. My meditation course gives you this help. I use the classical four stages of meditation from the Yogic tradition and have developed them into 9 simple steps common to all major world traditions. This course is open to people of all beliefs and none and the only requirement is a spirit of tolerance and respect for all world traditions. By the end of the course you will have your own personal experience of meditation and techniques that work for you. 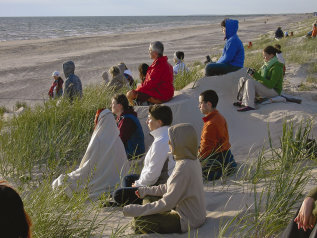 Perhaps the best way to capture the spirit of meditation is in a guided group situation. The first 20 minutes of my yoga class give you an excellent opportunity to experience this.